Please Note: This toner contains geranium oil so therefore smells like geranium. Geranium oil is used not for the scent but for the effect. It has been used back to the times of the Egyptians for promoting beautiful, radiant skin among other things. It prevents skin problems like sagging and wrinkling, and helps give your muscles a toned appearance. It can help eliminate the appearance of scars and dark spots by improving blood circulation just below the surface of the skin and promoting an equal distribution of melanin. It contains antibacterial, antifungal, and antioxidant properties. Geranium Essential Oil has a sweet, floral fragrance that calms and relaxes the body and mind. Directions: After cleansing, every morning & night, spray toner on a cotton pad and apply to face, neck & decollete area. Is also great for an all over body toning spray. Avoid the delicate tissue around the eyes. 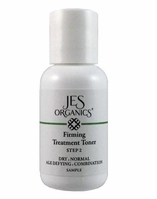 For optimal results, use the JES Organics complete skin care program. Discontinue use if you experience any skin irritation. "This toner is Oustanding! In 4 weeks my facial skin pores went from medium size to medium small, and now tighter pores and not noticable. I now have smooth and natural glowing skin!" "I LOVE this toner. A lot of toner's dry out my skin but I am SO impressed with this one, smells good, leaves my skin so soft & tight but not in that chemical feeling way I've gotten with other products. It's just perfect!"